Hypoxia is a deficiency of oxygen in inspired (inhaled) gases or in arterial blood and/or in the tissues. This is closely related to anoxia, which is a complete lack of oxygen in the tissues. One can think of anoxia as the most severe case of hypoxia. anemic hypoxia - results from a decreased concentration of hemoglobin. cerebral hypoxia - results from a decrease in oxygen supply to the brain even though there is adequate blood flow. hypoxic hypoxia - results from defective oxygenation of the blood in the lungs. ischemic hypoxia - results from slow peripheral circulation (also called stagnant hypoxia). Not uncommon following congestive cardiac failure. altitude sickness - nosebleed, nausea or pulmonary edema experienced at high altitudes. The most common symptom of hypoxia is cyanosis, a bluish cast to the skin, lips and/or fingernails. Get fresh air pumps, supplied air respirators, and other respiratory protection products at Safety Emporium. If your body isn't getting oxygen, you die. Make sure you recognize cyanosis when you see it. If working in an enclosed space or with an asphyxiant, move to a well-ventilated area if you become light-headed, weak or disoriented. Be sure you understand the dangers of carbon monoxide in the home and workplace. This nasty, invisible, odorless, colorless, gaseous poison can cause hypoxia and death! Cerebral hypoxia at the National Institute of Neurological Disorders and Stroke. Cerebral hypoxia at the NIH's MedLinePlus Medical Encyclopedia. Altitude sickness in the Merck Manual. The High Altitude Medicine Guide by Thomas E. Dietz, MD. Hypoxia can also refer low levels of dissolved oxygen in lakes, rivers or the occean. See the EPA's Mississippi & Gulf of Mexico hypoxia site for more information. 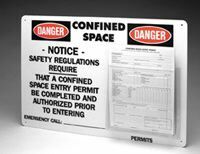 Safety Emporium carries signs and more to help you with your OSHA confined space entry requirements. See also: air, anesthesia, anoxia, asphyxiant, cyanosis.